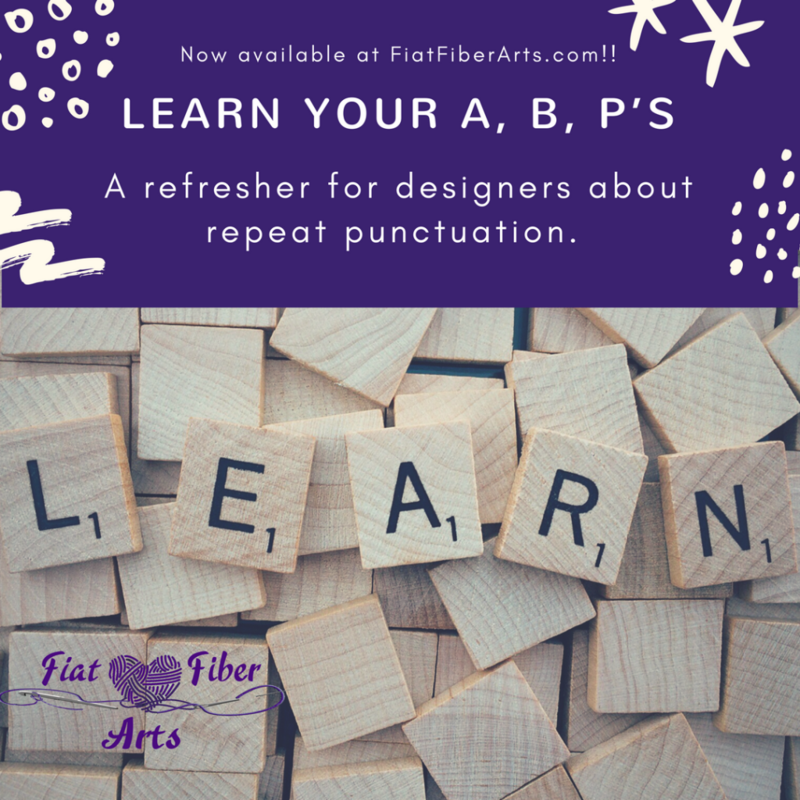 In today’s post about how to write crochet, we are going to be discussing the repeat punctuation. I did a lesson as a live video over on my facebook page and called it “Learn your A, B, P’s” for asterisks, brackets, and parentheses. I’ve been advertising this presentation from my instagram account for a while. Well, here it is! 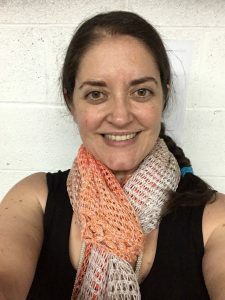 Writing crochet doesn’t need to be complicated. Yes, it looks like all types of repeat punctuation have the same instructions, but there are unique differences and I’ll explain them all. I cut myself off before I finished answering the question, so I started up a second video. Here’s the answer and a few other thoughts. I would love to hear your thoughts on these videos. Are they helpful? Is it new information for you? Is it the same old information but told in a new way? Or is it just a bit of a refresher for you? I think I’m going to try this again as a YouTube live, if it’s free for me. I have a pattern that has a multiple repeat in a multiple repeat. The instructions state that anything between * * and [ ] are to be repeated number of times indicated. It’s written: dc first 5 sts, [*ch 1, sk 1, dc* 2 times, dc next 8 sts] 5 times, *ch 1, sk 1, dc* 2 times, dc last 4 sts. Is this an okay way to use those repeat punctuations? Thanks for all the great info!! Bonnie, this is an excellent example to review. The instructions for the ** say to repeat the stitches indicating that you have already stitched them once. Whereas the () and  say to ‘work’ the stitches the indicated number of times. So, in your example, if I follow it literally, I will perform the *ch 1, sk 1, dc* a total of 3 times then work the 8 dc. After the  5 times, I will repeat the * to * two times. As a tech editor, the question I would put to you is, how many times am I really stitching that * to * section inside the bracket? This could be written: dc in first 5 sts, [*ch 1, sk 1, dc in next*, rep * to * once more, dc in next 8 sts] 5 times, rep * to * twice, dc in last 4 sts. Thank you! That’s almost exactly what I changed it to when working back through it with the info in your post so yay! 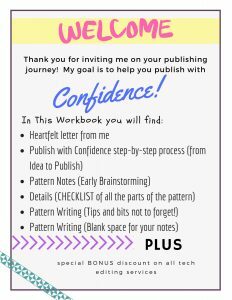 I am a new to pattern writing so glad I stumbled across this. It’s early enough that I can change all my patterns to the craft yarn council standards without too much frustration. Looking forward to reading more of your posts! Sure thing!! I’m always here if you wanted to send several patterns at once, that’s what the bulk tech edit is. I can double check them after you make your changes. What are your thoughts on writing out a pattern that repeats the same sequence of stitches for multiple rows? Such as a shawl? Rather than writing it all out I have labeled the repeats and written them out once. Then I indicate when to do each repeat with a total row and stitch count at the end. So, do you have it described in your notes section? Sounds like a row repeat. After establishing your pattern, there is a way to write rows and indicate, “repeat row X” until the final stitch count is a certain number, or for a set number of rows, to a certain size, etc. is that what you are doing? If it’s different types of repeat segments, if you define them in the notes, then you can refer to them that way. If you’re asking if you can set up a *to* in row 3 and in row 6 simply write “repeat from *to*” without writing the actual repeated stitches over and over, I have seen this, but it needs to be the ONLY *to* repeat that is mentioned prior to instructing them to repeat it. If you use *to* for more than one set of stitches, it needs to be redefined in each row/round where it is used. If this doesn’t answer your question, you can email me a portion of the pattern. This is very helpful. So glad I found it via Creative Yarn Entrepreneur’s Facebook post. Thank you! Thank you so much, Cheryl! Let me know if I can be of any help to you. Thanks for the videos! This was a helpful refresher. I’ve definitely improved in writing my instructions to be as clear as possible.